Archaeologists in the north-eastern province of Ha Giang stopped by on some very old relatives recently, when they stumbled across caves thought to have housed humans 20,000 years ago. The astonishing discovery came as an excavation team unearthed around 100 stone tools at the karst plateau areas in Can Ty Commune of Quan Ba District and in Pho Bang Town of Dong Van District in July, with several found in two caves which were once home to ancient inhabitants. 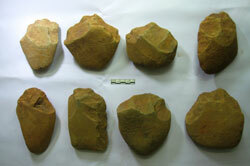 The relics, which date back to the Paleolithic, are mainly hoes and axes in a form typical to the period, according to Prof Trinh Nang Chung, from the Viet Nam Archaeology Institute. "The findings help widen people's knowledge of ancient culture in the mountainous north of Viet Nam," Chung told Viet Nam News. "It shows that humans lived here from a very early period and most of the tools were made from stones retrieved from the local river bed. "As you might expect, 20,000 years underground has caused the tools to become a dark yellow colour." Previous digs in the plateau have also unearthed human remains, however the uncovering of tools deep in the caves represents a groundbreaking discovery. Based on layers of sediments in the areas and the carving techniques of the stone tools, scientists believe that these were early living place for ancient people.